In Arizona, an order of protection offers protection from family members, including spouses, who have threatened or assaulted you. 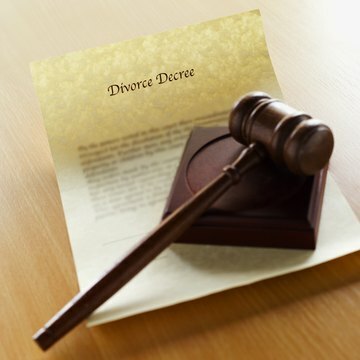 Protection orders are frequently requested as part of divorce proceedings. While these orders do not directly affect divorce or change divorce proceedings, they may be used as evidence against you or your spouse. You can request an order of protection during your preliminary divorce hearing or as part of the pleadings you file while litigating your divorce. Protective orders limit the contexts in which a person can contact you and permits you to call the police if the specifics of the order are violated. In Arizona, protective orders can be issued only against family members, including former spouses. There must have been some form of harassment, such as domestic violence, trespassing, kidnapping, violence against children, disorderly conduct or damage to property. If your case does not meet these standards, you can instead request an injunction against harassment. These can be issued against anyone who has engaged in a series of harmful or harassing actions. Judges often issue protective orders during preliminary divorce hearings. The orders may expire after a set period of time. You may also request a protective order from the court in the county where you reside at any time. Your spouse may contest the order; if this occurs, a hearing will be scheduled within 10 days. If your spouse was not previously violent but becomes violent during your divorce, your attorney may file a motion for a protective order at any phase during the divorce litigation. Depending upon the specific issues being litigated in your divorce, a protective order may be used against the person against whom it was issued. For example, if a wife obtained a protective order against her husband because he was abusing her in front of the children, this might be used to prevent him from obtaining custody. Abuse is also grounds for divorce in Arizona and can prevent your spouse from requesting a no-fault divorce. Protective orders can alter the division of property during divorce. An abusive spouse may be prohibited from entering the home of the abuse victim, and judges have the authority to temporarily order that only the victim have access to and control over the house. Frequently, the issuance of a protective order is used to advocate for the property rights of the abused spouse, and abuse victims frequently obtain sole ownership of property during divorce proceedings. Protective orders pose some logistical issues if the abusive spouse is paying child support or has visitation or custody of the children. The spouse against whom the order was issued may be required to mail or direct-deposit child support payments, for example. Exchanging your children at the end of one parent's visitation will violate the protective order if the two spouses see one another, so you may need to use a child custody exchange service to drop off and pick up your children. These facilities provide a safe place for parents to pick up their children without having to see the other spouse. The judge may order the use of a specific facility, or you and your spouse may have to come to an agreement or use a friend or family member.